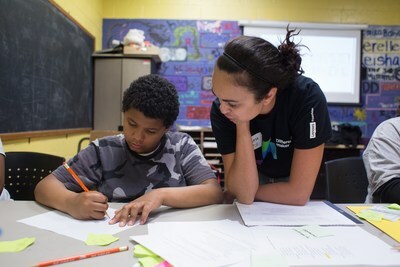 Lenovo to donate products and provide volunteer support at 10 Hackathons across the U.S.
RALEIGH, N.C., May 17, 2018 /PRNewswire/ -- Boys & Girls Clubs of America today announced a partnership with Lenovo to help expand its STEM programming nationwide. Lenovo's support involves funding and hosting app lab programming at 10 Club sites, including a two-day Hackathon this week with the Wake County Boys & Girls Club in Raleigh. Ten Lenovo employee volunteers will provide technology training and help judge Club members' final presentations. Lenovo is partnering with Boys & Girls Clubs of America to provide app lab programming at 10 Club sites, including a two-day Hackathon this week with the Wake County Boys & Girls Club in Raleigh. "Boys & Girls Clubs are committed to providing youth with resources such as interactive computer programs to help prepare them for a great future," said Jim Clark, president and CEO of Boys & Girls Clubs of America. "Thanks to Lenovo, we're helping more youth find their passion and discover different STEM careers." Club research shows that a high-quality Club experience enhances positive outcomes for members. The partnership with Lenovo helps enhance this by providing kids and teens with the knowledge to build simple apps and engaging them to shape their own experiences, while equipping Club staff with the resources to provide these fun, accessible moments over time. "Expanding our partnership with Boys & Girls Clubs nationally is a natural extension to our long-standing relationship with the Research Triangle Clubs," said Lenovo North America president Matt Zielinski. "What's especially exciting about this initiative is that we're engaging Lenovo employees across the U.S. to help inspire Club members in their communities to pursue STEM studies and rewarding careers that they can find at companies like Lenovo." During the hackathons, Club members break into teams and go through a series of steps to complete the project. The steps include: defining an audience and how the app will be used, developing a visual and a working prototype, and creating and practicing a presentation. Upon completion of the programming, Club members have the opportunity to present their app to showcase the knowledge and skills they learned from the program. Judges then award prizes to the winning teams. Lenovo hosted its first hackathon earlier this month with Boys & Girls Clubs of Metro Atlanta in Newnan, GA. Other events are planned for Hartford, CT; Santa Clara Valley, CA; Central Florida; Miami-Dade; Greater Dallas; King County, WA; Chicago and Greater Milwaukee. Lenovo is donating the PC equipment used for the hackathons. To learn more about the Lenovo and Boys & Girls Clubs of America partnership, please visit www.bgca.org/lenovo. Lenovo (HKSE: 992) (ADR: LNVGY) is a $43 billion global Fortune 500 company and a leader in providing innovative consumer, commercial, and data center technology. Their portfolio of high-quality, secure products and services covers PCs (including the legendary Think and multimode YOGA brands), workstations, servers, storage, networking, software (including ThinkSystem and ThinkAgile) solutions, smart TVs and a family of mobile products like smartphones (including the Motorola brand), tablets and apps. For more information about Lenovo, visit www.lenovo.com or follow them on LinkedIn, Facebook or Twitter (@Lenovo).